This past Saturday, Hans and I went to Raleigh, North Carolina for a craft/jewerly show at the Marbles Kid's Museum, sponsored by the The Handmade Market. Their slogan is "because mall is a four letter word". It was lovely, the organizers were delightful, and folks seemed to enjoy my work. It was well organized and there was a lot of incredible work. 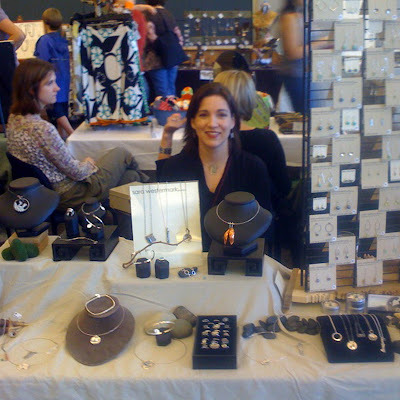 I was delighted to trade at the end of the show with several vendors. I got the kids some really nice Christmas presents. This picture is a bit fuzzy because it was on Hans' iphone.